EDIT: This pack has been converted to work on the latest stable NeoLemmix player (12.0.01). 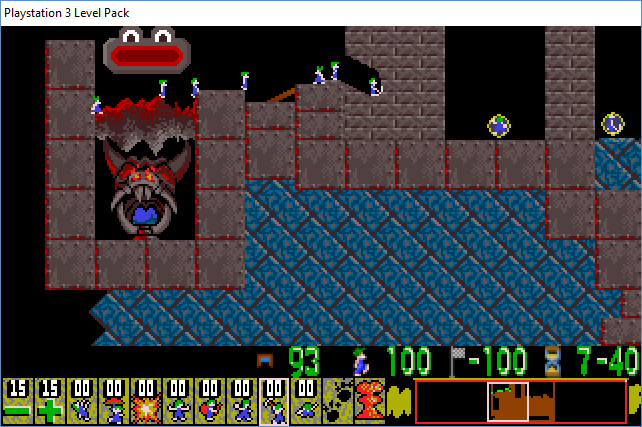 You may have noticed that some of my most recent posts have been referring to the PS3 version of Lemmings. If you are wondering when I'm ever going to release that pack, then look no further. 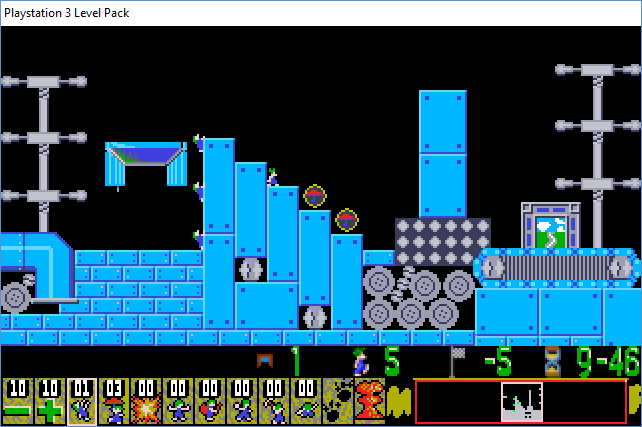 In this bundle is a level pack containing all 45 levels from the Playstation 3 version of Lemmings, some of them backroute-prone, split into five ranks, and two different graphic sets: Factory and Dark, the latter of which I rather lazily mixed up a few terrain pieces and objects from the Fire set with some new interesting ones, including the coolest entrance known to Lemmingkind, and the wizard of ax, a lonely lemming in a blue wizard suit with an intention to kill unwanted territories with a large axe! On both sets, there are notable differences to some existing NeoLemmix objects in comparison to the other sets, such as the teleporter and pickup skills, all of which are designed to make the game feel as familiar as possible. I will release an editor friendly version of these graphic sets later today. You will use the eight default skills, but on some levels, because there isn't a cloning machine in NeoLemmix, I have decided to use a cloner pickup skill instead, making it 9 in total. Some levels do provide a different solution altogether! So there you have it! Enjoy these levels, and my wonderful screenshots below. Any queries or problems I'm happy to help. Thanks for doing the PS3 remakes! With all the NeoLemmix features being added back then like pickup skills, teleporters and cloners, I was wondering if it would ever be possible to do PS3 remakes, and you've made it possible using the best of NeoLemmix's capabilities! I've started a video playthrough. For what it's worth, since it's already proven its potential through PS3 Lemmings, if there's enough demand for it, the addition of a proper "cloning machine" could be considered in the future (note that it would be considered low-priority for now - in other words, while I might slip it in at any point if I feel like "hey, I want to make that cloning machine now", I wouldn't go out of my way to do it until other far more important concerns are taken care of). Well, you're very welcome. I'm also pleased that I created my first graphic set and level pack using the gstool and flexi toolkit respectively. Can't wait to see the playthrough. You might particularly want to have a look at Mayhem 10, because basically I copied the levels just by watching a YouTube video. The player backrouted that level so badly that I wasn't able to see the details on the right side of the exit. Annoyingly the PS3 level previews don't display pickup skills, or any objects other than an entrance and exit. The PS3 graphics have been given a bigger sense of realism than ever before! GigaLem has given me better sprites for the exits of both graphic sets (Plus an entrance for the dark set too). The factory exit initially came out weird on the preview because of different pixel sizes for each frame, so I had to fix that. I also added frames to the other objects to make them more realistic. The new dark exit in particular had four frames, and each frame displayed the position of the eyes, thus resulting in constant eye blinking, making it too unrealistic, so I kept its eyes open for a further 12 frames. I've also acknowledged namida's new recommendation about singling object pieces. Now I'm ready to release my graphic sets, adding GigaLem's new objects as well as being designed to make them editor-friendly, hence the 'e' at the end of each file. I've kept the PS3 style large trigger area for pickup skills but if anyone objects to that I'm happy to change it back. ​Alright, I have finished this playthrough! As I have never played much of PS3 Lemmings, most of the levels are new to me. As the mechanics of NeoLemmix and PS3 differ, you might occasionally see me ranting about some levels that seem super-easy. A glaring example of this would be Tricky 6 "A nice little puzzle". After seeing how Flopsy did it in his PS3 playthrough, I realized why the level is indeed a puzzle after all. Overall, you've done a pretty good job recreating the levels. Of course, not everything can be completely possible such as the cloner skill. In the PS3 version, a lemming is immediately cloned when stepped into the cloning machine, and the clone walks in the same direction as the other one who activated it. In NeoLemmix, you just pick up the cloner skill, and can use it any other time you like after picking it up; this causes backroutes. Another interesting positive change, of course, is that there are no more "candle light" mechanics, minimizing the frustration in the game. I've only managed to save replays for Taxing 2-10 and Mayhem 1-10. The reason is that, at the time, I didn't have Auto-save replay feature on when doing my video playthrough. You will see how I solved the other levels in the playthrough. Otherwise, if you still need me to make replays for the other levels, let me know. Fun 4 "Give a lem a hand"
Fun 7 "From the Left In Order to Go Right"
Fun 10 "Beam me up Lemmy"
Tricky 2 "A change of direction"
Tricky 4 "Hero Lemming to the Rescue"
Tricky 9 "Down the Hatch"
Tricky 10 "Don't send me up there!" Taxing 2 "Down and Out"
Mayhem 1 "Lem Does This Lem Does That"
Mayhem 4 "Lemmy Have Another Go"
Mayhem 6 "Plan Ahead Mr. Lem"
The NXP still uses the old version of the entrance/exit in the Dark style and the exit in the Factory style, though. Tileset suggestion for Factory: The blue block on top of the gears trap can be very misleading as it looks very much like terrain. I would suggest making the blue block of a different color instead; even in the PS3 version the blocks on top of the gears are green. Also, is it possible if you can have add a green teleporter/receiver pair in the graphic sets? The PS3 version has a red teleporter/receiver pair and a green teleporter/receiver pair in some levels, while in the remakes all the teleporters are all red, which can be confusing (Trial 5 and Fun 7, for example). If NeoLemmix permits more than 15 objects in a graphic set then I should have no problems doing this. I will have a look and do all this tomorrow, as I have been busy today. I think there's also a blue teleporter somewhere as well as a red and green one - in Trial 5? Indeed, NeoLemmix graphic sets can now have more than 15 objects. Look at GigaLem's Freedom Planet tilesets for example - these have a lot of background objects, making those well over 20 objects! And yup, Trial 5 also has a blue teleporter. EDIT: The teleporters will also need a sound. Another thing to point out: for the Factory style, the naming should be 16 characters long, as NeoLemmix only accepts graphic sets with a character length of sixteen characters. "minim_ps3factorye" is 17 characters long. Perhaps you should remove the "e" at the end for both graphic sets. Oh dear. I think the pressure's got to me with all these update requests. I've accidentally overwritten one of my graphic sets. Quite devastated in truth. Fortunately I do have a backup, but it's going to take quite a while if you want an updated version of the PS3 level pack. 1) This looks pretty much like a trap, but as there are already a few other traps in this style, I wonder whether it could be a teleporter, a radiation or a slowfreeze object? If it is just normal terrain, then it looks far more interactive than a lot of other stuff. 2) In my opinion, exits should look like the most friendly object in the whole level. In this case it looks much more like usual terrain or a trap than an exit. Why not keep the L1-rule with blue sky and green grass in the middle of the exit? 3) The blue block on top of this trap looks exactly like a solid terrain block, while it isn't solid. This is very confusing. 4) I took this to be the exit. Somehow the wooden frame looks much more inviting than the actual exit. But (at least according to IchoTolot) this is a trap! I am completely missing any signs of danger on the object (to distinguish it from exits, teleporters, radiation or slowfreeze objects). 5) This I took to be usual solid terrain, instead of recognizing it as a trap. And even knowing that it is a trap, I would have expected the trigger area to be at the door in the middle, not to the side of the object. All of these objects are nice to look at, but could you please modify them slightly and add more visual clues as to their identity? Re: 5, I would disagree that it looks like solid terrain; I would think it's either an exit or a teleporter (I wouldn't expect a trap). Suspicion of teleporter may only be due to the level having two of them, where my next thought would be "how is it distinguished from the receiver"? Agreed about the trigger area. The rest of your points, I agree with. One other major concern: The blue blocks with nails / screws in the corner, if it weren't for some having one-way arrows on them, I would think these were steel. First of all, Wow, amazing what designers can do to a graphic set. That level is a masterpiece! You raised a couple of interesting points here for a user who's trying out the graphic set without playing the associated pack. 1. Is meant to be a receiver. There is a visual clue somewhere. it's just that in this level the teleporter and receiver were spaced far apart. Wafflem suggested that I should add teleporters of different colours. 2. Is the exit that's more akin to the game; but I didn't design that one: It was Gigalem who created it. I initially created the exit that had the sky and grass. It looks like the attachment below. 3. A couple of people have mentioned and criticised this one: I'll look at this one again and try and prevent the top part of it from looking like a brick. 4. It is indeed a trap. I think I need to ask GigaLem to try and recreate the one in the video (see here, at 9:35), as my one appears to look like an exit. 5. Apologies about this one, as this was just a poorly designed sucker trap. This (at 5:24) is what it's meant to look like. Still, in the main game it's hard to recognise that thing compared to the background. While converting Minim's graphic sets I decided to convert his PS3 remake level pack as well to work on the latest stable NeoLemmix version (10.13.X). As mentioned, Minim has not been active on the forums lately and it would be a shame for his level pack to be forgotten or buried in the back away from new users/players. I have attached the level pack in the first post.